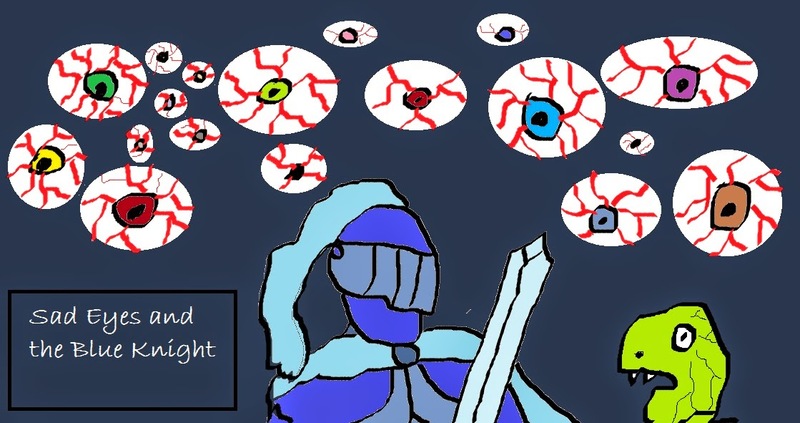 I just had this image of a blue knight going through a dungeon and dozens of eyeballs appear behind him in the dark. No idea what’s connected to the eyeballs if anything. I like drawing eyeballs. I like to dabble with these kind of images because sometimes they inspire me to write stories. I guess this story wouldn’t end well for this particular hapless knight. I’ve been doing a series of short stories about Pedro Carina who is an unlucky/lucky pseudo-adventurer. But after my experimenting with a map of Groteskia, I’ve considered given this splatter-elf idea an honest go. An honest go meaning go full tilt bat-sh*t crazy with my writing. Perhaps this unnamed blue knight is the hapless hero dumped into Groteskia, a world of ceaseless dangers where he has the misfortune of dying over and over again. Could be kind of like the game Dark Souls mixed with Groundhog Day. I know the idea’s been done before, but if the blue knight suffers over and over again in all the different hell-scapes of Grotsekia, perhaps he’s looking for a way out? Hmm…food for thought.